Over the course of doing my online research, I would always find examples of Travilla's designs for sale on ebay, esty, or vintage clothing sites. I really did try to resist the temptation, I couldn't, so I'd like to share a few pieces from my personal collection gathered over the past few years. I love Travilla's designs from the 1950s and 1960s, the majority of my collection, but some later pieces have slipped in for some reason or another. 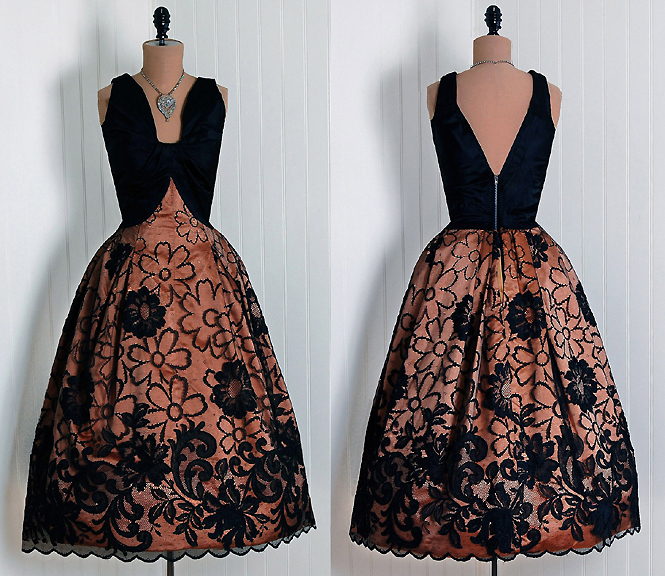 A late 1950s evening dress of peach/salmon silk skirt. 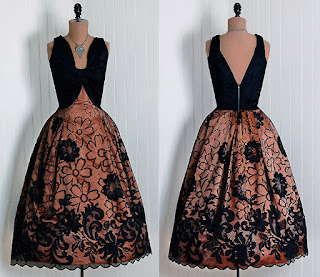 Black floral lace overlay with scalloped hem. Black velvet sleeveless butterfly front top. Though many film designers such as Adrian had private labels or small shops in Hollywood, it was Travilla who mastered the art of promoting his label through the medium of film and television. 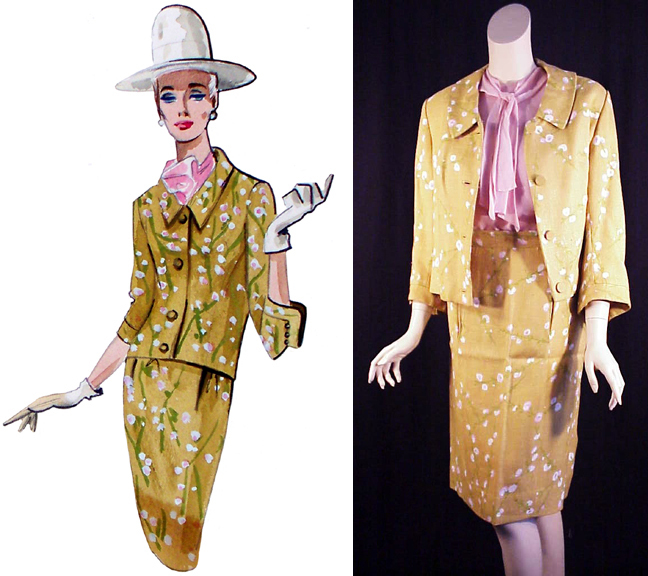 To promote1964's "Signpost to Murder" starring Joanne Woodward and Paul Newman, for a series of promotional "Murder in Fashion" charity events, MGM shipped Woodward's wardrobe to Alexandria Virginia where it was seen by two thousand social, style and civic leaders during a showing of Travilla's latest collection. 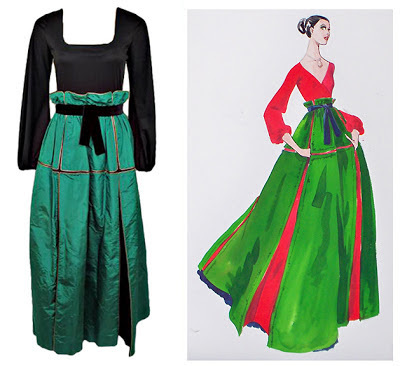 These two garments are examples from that collection.The first is a jade green day dress in a knit material with translucent decoletage and pleats at the sleeves and waistline. 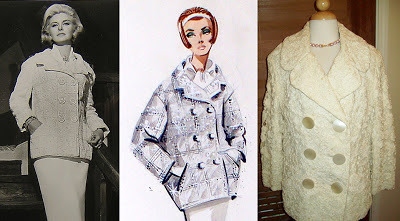 Second is an evening jacket with lace overlay. Wide lapel collar and large pearlized buttons. Travilla's partner William "Bill" Sarris, was also a designer aside from the business end, having graduated from Woodbury as well. This is one of two pieces I've managed to find from his label. Circa 1965 it looks like it could be worn by a very fashion forward nun. 1965 evening gown of yellow crepe with cascading rows of fabric. Love the flowing cape-let. Newspaper photo located during online research. 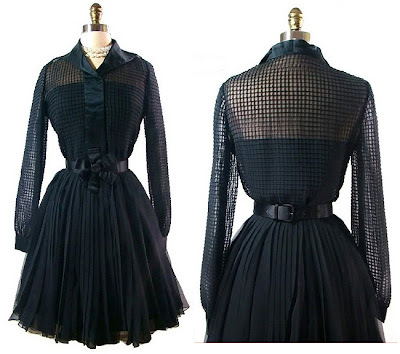 Need to locate a vintage belt as the original is missing. 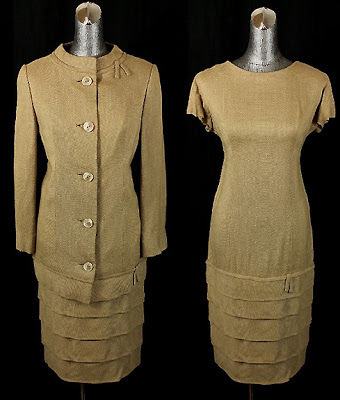 With the skirt of the dress matching the gown above, I'm guessing 1964/5 for this two-piece ensemble ofcoffee tweed fabric with decorative bows on the jacket collar and hem and dress. 1965 Nubby 2-piece suit with floral pattern. Pink blouse with tie-scarf. Unfortunately, I don't have the hat or gloves to go with it. Yet. 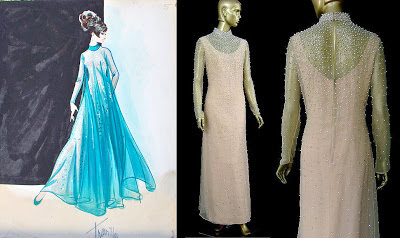 Late 1960s rose colored evening gown with overlay sheath of net with rhinestones. Similar in style but reversed with the stones on the overlay instead of gown to the one in a sketch for singer Connie Francis and her Las Vegas stage show. 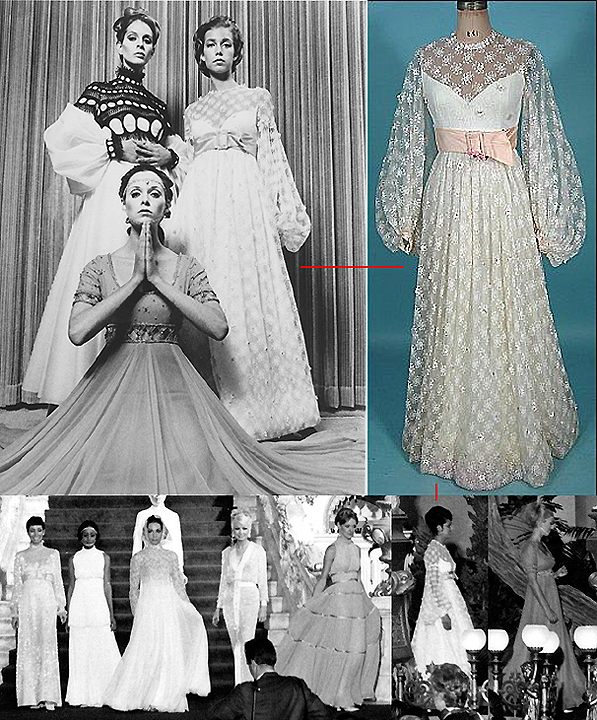 1968 White dress with lace overlay and small pink flowers attached. 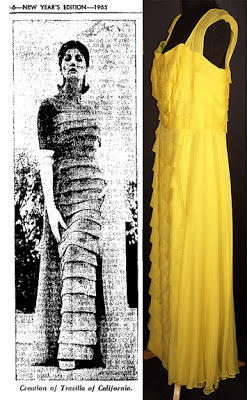 I found the dress through a high-end online store, so I'm not sure it's the same one featured in the photographs from the Archives. But this is the retail version similar to one worn by actress Diahann Carroll on a variety special. The lower photo is of the gown in Travilla's Fall 1968 fashion show for the press, held on the "Hello Dolly" set at Fox Studios and hosted by Miss Carroll. This is my favorite piece in the collection. 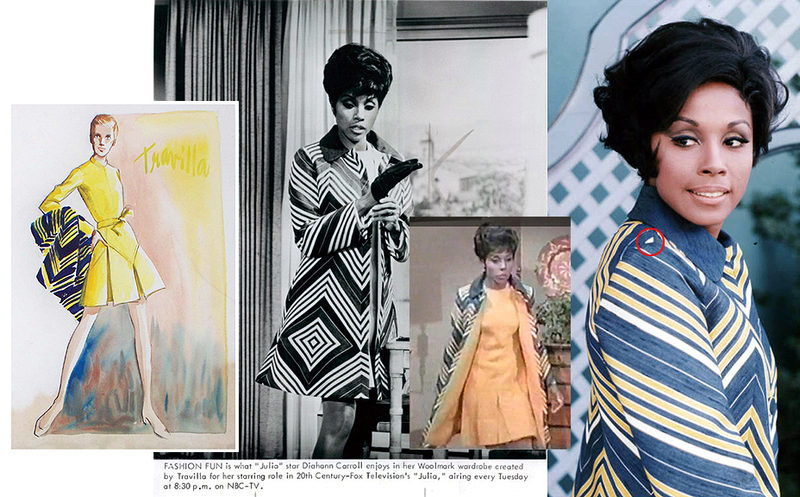 It epitomizes the 1960s for me. 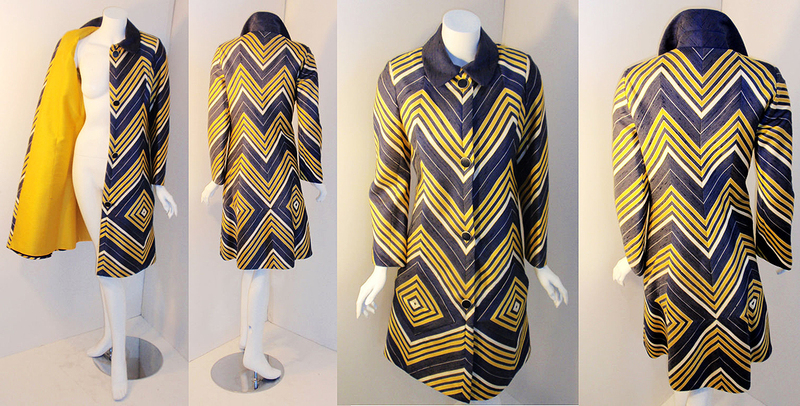 Ladies day coat with a bold geometric design in bright yellow, blue and white. Constructed from raw linen with hand sewn stitching. The most amazing thing is that all of the mitered corners of the striped design match up perfectly. Lined in solid yellow raw silk. Fabric covered buttons. I literally freaked when I found the photo and then youtube footage of Carroll wearing this coat on an episode of Julia. Unfortunately there are at least two as a photo later located shows a small triangle of white on the right shoulder mine doesn't have (red circle). Sketch found in the archives shortly thereafter. 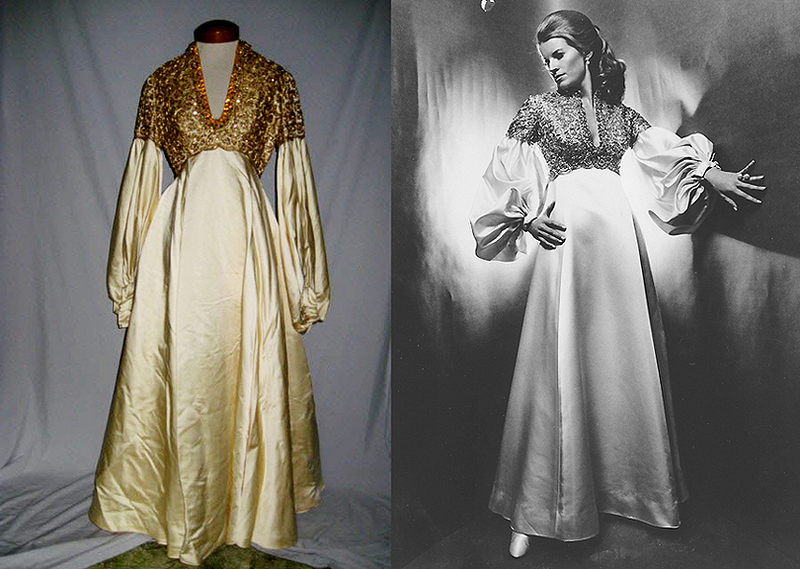 Heavy silk gown with empire waistline probably 1968/69. Heavy orange and gold beading on bodice, and upper sleeves. Purchased on ebay from a museum that was cleaning out it's collection. Later found the photo of actress Julie Sommars wearing it in the Archives. It's one of several versions of a dress designed for Diahann Carroll worn both on "Julia" and a Perry Como Christmas Special. 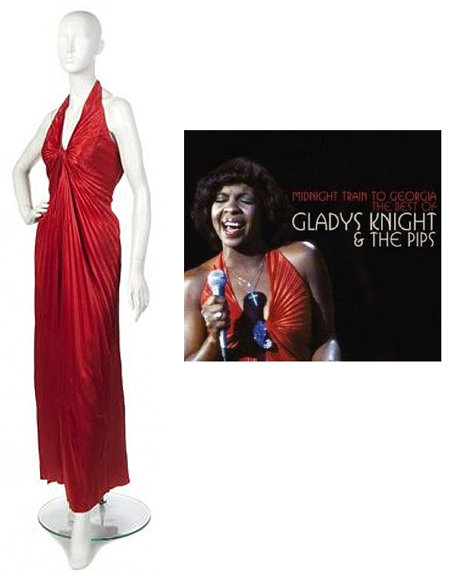 Mariyn-inspired 1970s gown worn by Gladys Knight on the cover of her "Midnight Train to Georgia" alcum cover. Purchased at auction from Knight Estate. 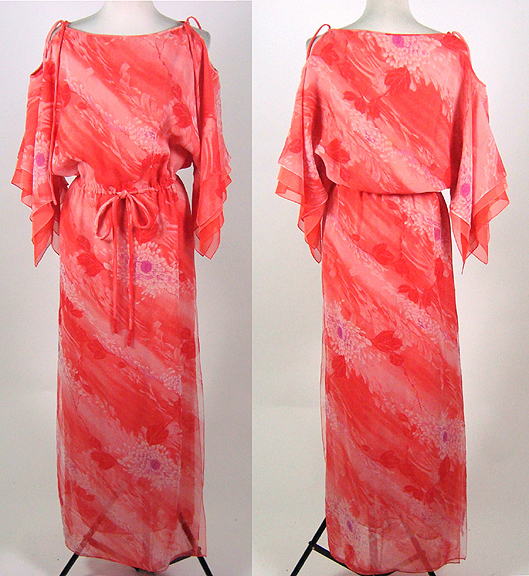 Late 1970s coral pink sheath. 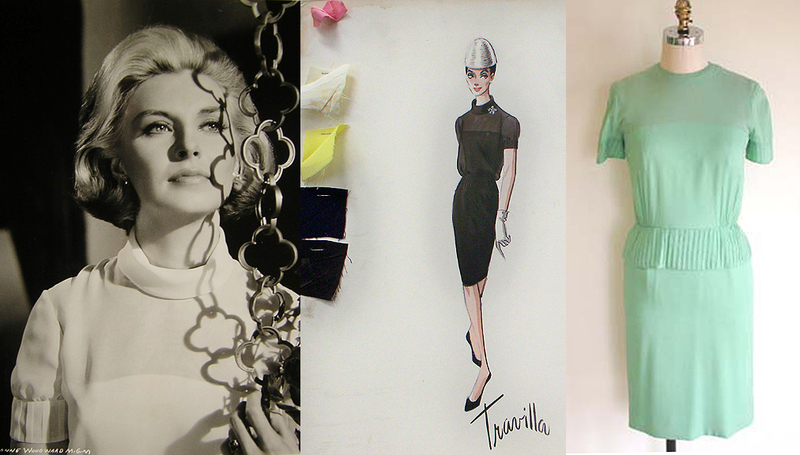 A perfect example of the "California Couture" Travilla was known for. Hankerchief hem sleeves with open shoulder ties. 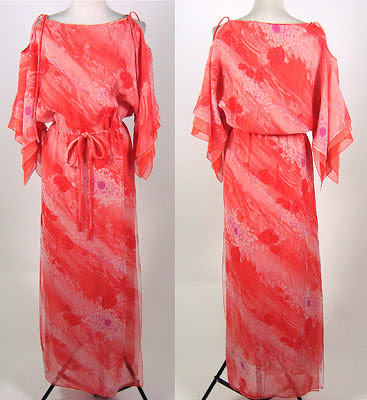 1970s hostess party gown. At the price offered, even though I'm not fond of it, I couldn't not give it a home. I felt better when I later found the sketch.